I recently picked up a large Sheraton sofa at a tag sale. I am trying to furnish our new house with only antique furniture - for the quality, but also, for the affordability. Because oddly enough, these beautiful works of art which were handcrafted using the most high quality solid woods, are also as or more affordable than new furniture. Antique furniture is also a very green option, which is something that has always been tremendously important to me. I've never seen a Sheraton sofa with this style of arm before. The arm reminds me of the volute ram's head stair railing in our center hall. I'm curious as to the story behind it. It is very sturdy with four fluted Federal feet in the front and two legs in the back. It does need some work (upholstery and I'd like to lighten the wood stain) but structurally, it is in very good shape. As an upholsterer, I'm thrilled to see anyone who's interested in quality old pieces. That said, I'm not too sure what's going on with this sofa. Right off the bat, it just doesn't quite look right, and I strongly suspect that it's been modified in some way. The only way to know for sure is to strip off the upholstery. It's still a very beautiful frame, and it will look great once it's fixed up. As a fun side note, the side profile and back are nearly identical to a small settee that I bought and completely restored a few years ago. Mine had just 2 queen Anne legs, and plain rear legs, but the frame on it was awesome. Sadly, it had been covered-over 4 times without any proper repairs to the foundation, and it was a complete mess. I was able to save everything, and re-string and re-stitch it the same way. I only paid 30$ for the settee, and another 150$(ish) for all the new fabric, new burlap, webbing, etc. Well done! I often wish I had the talent to upholster, it is quite an art form. I've done a little research on our piece and think it may be from around 1820. Perhaps edging towards the Empire style with the rounded arm detail? I would look it up in my antique furniture book but it's been packed away for our move. It's hard to say for sure exactly what period the sofa is from (especially from just a few photos). It could be as early as 1820s as you say, but it could also be a well made Revival piece from the later 1800s. In either case, it's a wonderful frame, and it will fit in very nicely with the house. I would think that a Damask print would look amazing on this, or a very colonial blue and white print, but I know you're also quite fond of plain white cotton duck (which would also look good). What is the Antique Furniture Book you speak of....I've been looking to find an encyclopedia of antiques that would make it easy to look something up. Any recommendations? I agree so much about the value of it being a greener option. It is in fact my driving force to find pieces made before 1970 (when chemicals started to be applied to furnishings). Also, of course, it's the idea of re-purposing the beautiful furniture pieces that already exist. I so love the idea of using antique furniture -- the workmanship, the history, and re-use, the INITIAL lower cost. . . but that is where I often find I have to stop. 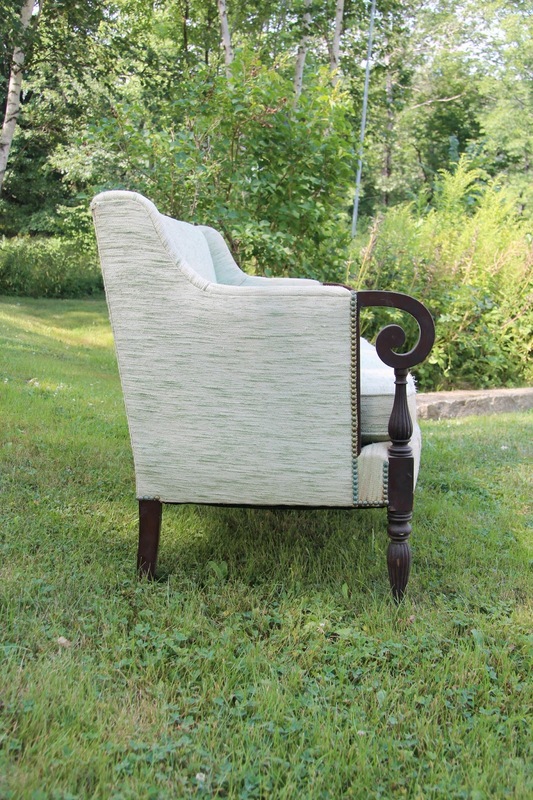 I have found a few beautiful pieces, but the cost to either reupholster or slipcover has taken the finished piece from the more economical option to above my budget. Any advice you can share about ways to reupholster on a budget would be much appreciated. Thanks! I think it depends on where you live. I have a friend who pays much more than I pay for upholstery work. And depending on fabric and how much work is needed, I have found that the cost is still below or similar to what one would pay for a good sofa (Lee Industries, etc.). But it's certainly not the most convenient path for a lot of the leg work is left up to you - find the piece, find fabric, someone to do it, etc. But one of my main goals in furnishing our home, is to find things that are not laden with chemicals. For the peace of mind on that alone, I feel that older furniture (pre-1970) is the path for me. How exciting to finally be moving in to your lovely home! This series of posts is incredible. Thanks for linking. Your dedication is very admirable and I now have a massive appreciation for how much work goes into reupholstering and restoring a piece. It's the perfect answer to the comment below about the cost involved in such an endeavour. Sorry, that reply was supposed to be for JC above. I thought the upholstering process of the settee he linked to above was fascinating. I like the sofa! It'll look wonderful all fixed up. Also, horray for moving in! Cheers to your and Mike's progress! Great link...Yes, Sheraton sofa's either have the wood trim on the back or have a more boxed back. Until we remove the fabric on ours, we won't know for sure what it was originally. It will interesting to find out! Flo, it's hard to say exactly what I think is "off" about it, but it could simply be the fact that it currently looks too "puffy" because it was covered-over by a previous (poor) upholsterer, rather than being redone properly (stripped to bare frame). Let's just say that after being in upholstery for a few years, I can pretty much tell when something isn't quite right. It could also be that there's a wooden rail above the legs under the fabric (because the deck looks too thick), or along the back (covered over), or that the foam cushions don't quite fit the period (it should probably have down a filled cushion). Going back to the deck, it's also possible that this frame didn't have springs in it, and that springs were added later (which is why the deck looks too deep), etc. Lots of variables. The nice thing about historic upholstery is that all the materials are still available, and it can easily be put right again. I can't wait to see more posts about this sofa in the coming weeks/months. I love the settee! I am curious how you deal with lead in antique furniture. I recently had a horrible experience finding out a gorgeous antique linen press contained lead (I did not realize stain and clear coat can both contain lead ... paint is not the only culprit). Previously I loved antiques and bought them frequently, but now I am very wary. How do you go about choosing safely? I know you take lead very seriously, as do I. This was a total shocker for me (and to many of the lead experts I spoke with). Would love to know how to handle this, as I really don't want to give up buying antiques! I use the lead test kits on anything I'm not sure about. They are very reliable and recommended by lead experts. It's very surprising where lead is found - even unpainted or unstained wood can turn positive. This is because there is some residue from a previous finish. Also, you can seal antique surfaces with a matte finish. I have used a product by Vermont Natural Coatings to do this and it works great! This is a beautiful piece of furniture. Looking forward to seeing it in your new home. I am wondering how you go about re-upholstering without using any kind of toxic chemicals. I recently re-upholstered a cushion and had to throw it out in the end because of the horrible smell. Not sure if it was from the foam used or the fabric itself. Can you share some advice about avoiding toxic chemicals when re-upholstering- and keeping the cost low? I think it may easier today (even just a few years later) to find such resources. Ever since the toxicity of furnishings became public, people have been asking for safer alternatives and therefore, options have increased significantly. Good luck! Generally, antique pieces will be stuffed with natural materials (jute webbing, burlap, straw, cotton, and occasionally horse or hog hair, and down/feathers). Even with natural materials, there can still be some smells in the product. New burlap, for example, has a kerosene type smell. If you have any sensitive allergies when it comes to odors, it's best to go over options with your upholsterer. There are quite a few hypoallergenic options, including unbleached cotton, linens, and filler materials such as Dacron (pillow stuffing), etc. A great find here! I agree with restoring older furniture items. I believe the construction of the "bones" was much better than the pieces that can be purchased today. Anxious to see your fabric and wood color choices. I have enjoyed blending contemporary pieces with refinished antiques for the past decade. I learned the hard way, however, to only purchase sofas and chairs with hardwood frames. Who knows, maybe someday those frames will be reupholstered by my grandchildren. In her younger years, my mother-in-law used to drag home furniture carcasses from garage sales and dust heaps and transform them into something beautiful. We used to tease her that her favorite color, white, wasn't really a color. Since the day I married her son 39 years ago, she has been my inspiration. I have followed your blog for several years and have always loved the way you furnish your home. You, too, inspire me. You are so kind, thank you for your kind words. I think you have found quite a lovely piece. Catherine- thanks so much! Appreciate your help and advice. Very much looking forward to seeing how you decorate your beautiful new home. Alles Liebe und viel Erfolg bei der Suche nach älteren Stücken! I have been following your house progress all along even though I seldom comment. Wishing you much joy in this new house and a smooth move in! That is great news for you!!! I can hardly wait for you to share all your decorated rooms! It's a beautiful piece! I can't wait to see it finished how you reupholster it. My home is also full of old pieces that I've searched for over a lifetime. I've followed you for years and love to see what you do with your beautiful antiques and lovely homes. 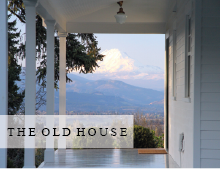 It's a dream of mine to totally redo an old home (which will never be realized), so I get to do it vicariously through you! Love to see the move in, long awaited and I know so well you planned to bring in antiques when you first stated the remodeling of your home you introduced some old finds and it was the start of the excitement to see this project in completion. 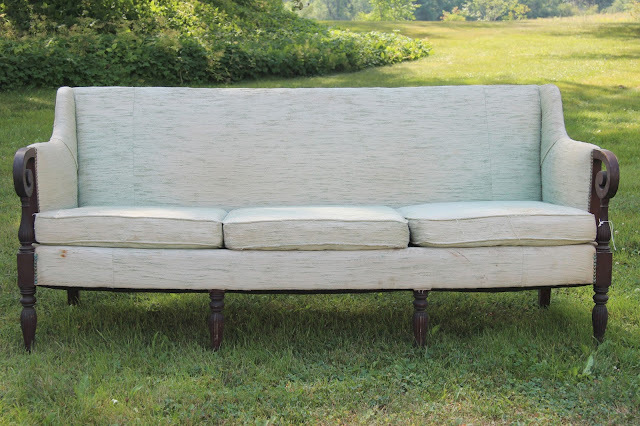 I love the sofa, and lightening the wood will be great, and can't wait to see its new upholstery job and placed in your home demanding all the attention it deserves. I too fill my home with not only antiques, but vintage, as well as salvaged from a good thrifting find. Going green saves our planet, and landfills from all the waste of unwanted. Love that you too are focused on giving your home some authentic love with found pieces that deservingly belong in your hands and home. Looking forward to the reveal. Beautiful weekend to you and yours...a country living weekend! Thank you Dore - and I so agree about the many wonderful benefits of antiques! It is funny to see your sofa as I just missed a chance to buy a vintage Southwood Hepplewite sofa. Sofas such as this and the Sheraton you bought are priceless. It is touching to know that others feel as I do that these sofas need to be used, kept up, and enjoyed for their beauty and craftsmanship. And so to congratulate your family on the craftsmanship accomplished that now leads to all of you walking into a loved home. May the ebb and flow of your day to day time spent there be filled with an awareness of being blessed with the history of so many lives. Thank you so much Karen. I so agree about the blessings of history that come with antiques. While you're busy unpacking and moving, we should start a "What will Catherine Put/Do/Hang Inside the House First?" group meditation. I'm going with the seagrass rugs going down first. Cheers Mike and Catherine! Definitely, hang the mirrors! That may be the very first thing for the joy of it, but also, just to get them on the wall and out of harms way. But which mirrors go where...? That's something I seem to focus on when I am falling asleep at night. And as for the rugs, I have to do some rug ordering this week! Could you please point me in the right direction for a green mattress? Would love your input and happy to trust your research so I don't have to do it myself :) thanks! 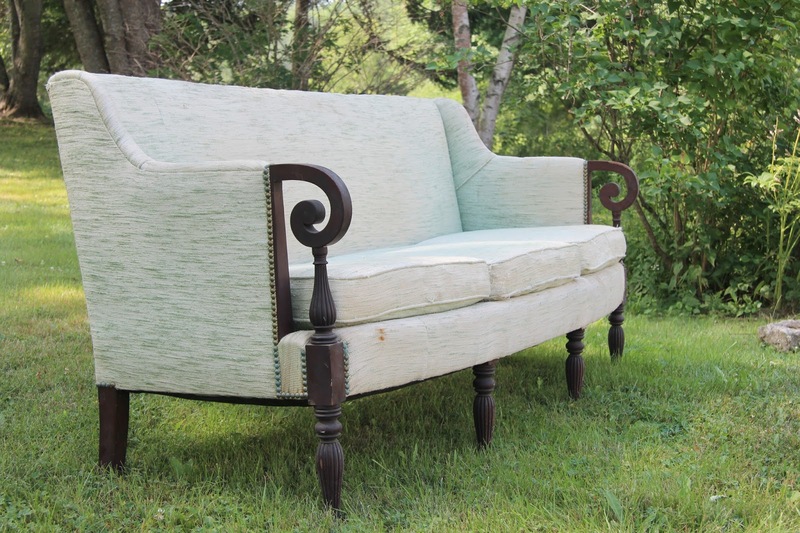 In the FYI department: I had to go hunting for this pic of a similar sofa I'd remembered from the [ongoing] restoration of a Federal in the Hudson Valley NY. The blogger "Reggie Darling" and his spouse [Craig Fitt and Bruce Shostak] have put years of work into the house, and they've started another phase being detailed on Bruce Shostak's Instagram. It's really beautiful! Love it. Oh where, oh where, has my favorite blog gone? Oh where, oh where, can it be? Catherine - I am sure you are busy with work, moving in to the new house, mothering, etc. but oh, how I miss your posts! Come back, Catherine! I'm dying to see your house! Dear Catherine, please do blog again soon. I miss your posts so much! Are you done with your blog? Every day - every day - since Aug 9 I check to see if there's a new post. I'm a little bit sad every day because there isn't. I'm dying to see what you did with the sofa. If you are done, let me know so I stop looking and being sad. I know the sofa will be wonderful and I can hardly wait to see your new home. Such an exciting time! I miss your posts. Hope you are well and enjoying this lovely new home. Where are the amazing posts? I cant seem to find anything past this one. Is there a new link that I am missing?